Outreach visits started in May to provide farrier, dental and general care and advice to donkey owners on the island. Sadly, the numbers of true working village donkeys are declining but there are still several very elderly owners and donkeys working out on the land every day. The saddle pads and equipment used on the donkeys is often between 50 and 100 years old and it’s extremely rare for the wooden frames on top of the pad to cause any sores or pressure points. The materials used for the pads are tough but breathable which helps the donkeys in the heat by absorbing any sweat and with thick wool padding, protect the donkeys back. The owners of these donkeys are incredibly fit having done hard physical work all of their lives and often still ride their donkeys to work and to the nearest village. Mind you, with advancing years and a touch of arthritis, it can be interesting to watch some of the old ladies getting back on their donkeys! 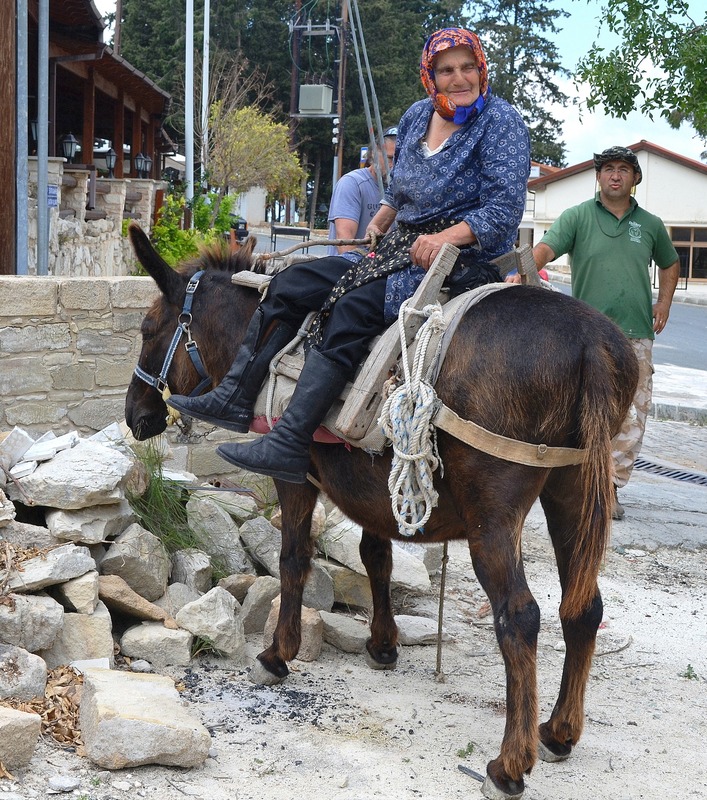 This photo shows 85 year old Panagiota successfully back on her 27 year old donkey Aristodelos. We almost couldn’t watch as she scrambled up on the pile of stones before launching herself – very accurately – onto the pad and frame. What was even more worrying was that she used the long rope from Aristodelos head collar as a sort of seat belt to tie herself on! Well there might not be much Health and Safety here on Cyprus but these dear old folks, and their elderly donkeys, are still going strong!